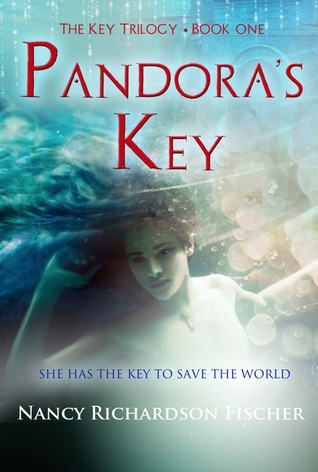 Today I have an interview with Nancy Richardson Fischer, author of Pandora’s Key, the first book of Yhe Key Trilogy. Starting! If you’re a creative person and have a vivid imagination it’s easy to come up with an idea for a story. The hard part is sitting down and turning that spark into a fire that can fuel a 300+ page book. What if Pandora’s Box really existed? What if the Greek Myth was wrong and something other than Hope was left inside the Box when Pandora opened it and released the Furies? What if that thing left inside the box (the Fifth Fury) was more devastating than any of the Four released Furies? Who might have Pandora’s Box in present day and would that person know what’s inside? After asking those questions I then needed to create the world and characters that would bring my story to life. That meant a first word, a first sentence, a first paragraph that really MATTERED because the beginning of a book feeds the fire and if it’s not good… well, then the fire will fizzle and you’ll be left with a smoking pile of… nothing great. Both my favourite part and most nerve-wracking part of writing a book is when I give my first draft to a reader. I write because I LOVE telling stories and in order to tell a story, it has to be read and appreciated. That first draft isn’t the finished product, but if a reader isn’t captivated by it, then I know I’ve missed the boat and need to do some serious revision. My husband, Henry, read the first draft of PANDORA’S KEY and he didn’t want to put it down. That’s not to say that he loved every little bit (I did months of revisions) but the fact that he thought it was a story worth reading made me feel like the clouds had parted, the sky was blue, and the birds were singing. When I was a kid my parents would read Charles Dickens to us – a chapter a night after dinner. The thing about Dickens is that every chapter ends in a cliffhanger and pretty soon I was sneaking books off the shelf so I could read more of the story. Couple that with short stories on Greek Mythology that I couldn’t put down and I was hooked. I started writing stories when I was in third grade, and I never really stopped! I was an English major in college, took a job as a writer for Ringling Bros. & Barnum and Bailey Circus when I graduated, and followed that job working as the Senior Campaign Writer for University of California, San Francisco. After two office jobs writing what other people wanted I realized that I needed to start writing stories again or my soul was going to whither beneath a circus tent and fluorescent lights. So I quit my job and became a freelance writer. I got my first book deal at age 23 (a sport autobiography about famed gymnastics coach Bela Karolyi) and I never looked back. Seven sport autobiographies and three Star Wars Junior Jedi books later, I was ready to take the leap. PANDORA’S KEY is the kind of book I have always loved reading, with a cliff-hanger at the end of every chapter, plus an infusion of Greek Mythology in a modern-day coming of age tale that makes it unique and hopefully super captivating. My hope is that my book will inspire one of my readers to become a writer the way I was inspired by Dickens. The research I did for PANDORA’S KEY involved reading a lot of Greek Mythology (which was a pleasure). I’ve always toyed with the idea of taking a Greek Myth and rewriting it to suit a modern-day story, so my first step was to find a myth that would work. I also did a lot of research on several medical conditions and various medical techniques and protocol to make Malledy’s disease, Olivia’s diagnosis, and Tim’s situation as real as possible. I wish I didn’t read reviews and that they weren’t so very important to me, but I do. In fact I go to Goodreads and Amazon accounts every morning to check my reviews! Here’s the other thing, reviews also let an author know that people are reading her book and hopefully enjoying it. Writing is such a solitary profession – it’s just you, sitting at a desk, tapping away on a computer, making up a book. There’s no way to know if your story is impossible to put down and compelling unless someone reads it and reviews it! So reviews MATTER because they’re validation that an author isn’t wasting her time and that readers love a story and want to read another one! Bar none, my favourite part of promoting PANDORA’S KEY is interacting with readers. I love hearing from readers who want to chat about their favourite books because who doesn’t want great book recommendations? I especially love emails from people who have just finished PANDORA’S KEY and have thoughts, questions or tell me what they’re hoping to see in THE KEY TO TARTARUS, Book Two of The Key Trilogy. Readers usually write me on my Facebook Fanpage and I ALWAYS write back! Readers’ input definitely effects the choices I make in my books so if I get requests for more of Raphe or Evangeline in Book Two, or a desire to see their romance heat up (don’t worry, it does☺) I take notice! I will say this, I love a great villain, especially if he’s strangely empathetic. Malledy was one of my favourite characters in Pandora’s Key, but of course I love Evangeline, too, because she’s so not perfect and it’s her flaws that make her relatable. And there’s a special place in my heart for Tim Sullivan, because he’s so damaged but there’s such a great guy beneath his emotional wounds. Thanks for reading my Author Interview!!! I was born on the east coast and went to Cornell University. After college I worked as a writer for Ringling Bros. Barnum & Bailey Circus. It was a fun first job and I learned how to write quickly, and also that when elephants sneeze on you it’s very (VERY) messy. After a year in the circus, I moved out west. I lived in Aspen, Colorado where I skied as much as possible and worked as a waitress in a Mexican restaurant. Great experience but I learned that waitressing is hard (HARD) and I’m not very good at it. I’ve always loved books with adventure, magic, and dark forces. I’m a huge fan of Stephen King, Peter Straub, Neil Gaiman, Suzanne Collins and George R.R. Martin. Those writers allow a reader to lose themselves in stories that are intense, sometimes other-worldly, yet strangely believable. I feel incredibly lucky that now I have the chance to create books for readers that will hopefully captivate and transport them into a world where the supernatural is possible with characters that they can relate to who are flawed yet totally compelling. Today I live in the Pacific Northwest with my amazing husband, Henry, and our mostly loveable (but sometimes vorpal) Vizsla, Boone. When I’m not conjuring a story, I love to kite-board, bike, ski or plan adventures with Boone and Henry, who both make me laugh for different reasons and who are the best partners in fun a gal could ever imagine. On Evangeline’s 16th birthday her mother gives her a necklace with an antique key charm—a family heirloom, though no one knows what the key unlocks. Everything changes. Her mom is hospitalized. Her godmother attempts murder. An ancient Order tries to kill Evangeline, and a lethal sect to kidnap her. Nothing makes sense—especially Evangeline’s own face, which has morphed from geeky to eerily stunning; the ancient key that feels strangely alive against her skin; and the magical abilities she begins to possess.